Synergy means the total is more than the sum of its parts. Synergy occurs when the combined power of a group of things when working together, become greater than the total power achieved by each working separately. It is commonly expressed 2+2=6,100,1000, 1000000... to infinity. In Islamic synergy, if we do one good deed with good intention we get multiple rewards. We may do many good deeds in our lifetime. The combined rewards for these good deeds are many times more than the total reward earned by each good deed separately. Two people combining their energy and ideas produce additional output. According to Prophetic tradition if an individual gets Hidayath because of your efforts, you will receive returns much greater than all the wealth put together on earth. Similarly, in Islamic synergy the propagator and receiver earn the rewards by mutually understanding the lofty Islamic principles based on the Truth. This when put into practice translates into infinite rewards for both in the hereafter. A group or an organization or a society who indulge in such activities are called the True Ummah. 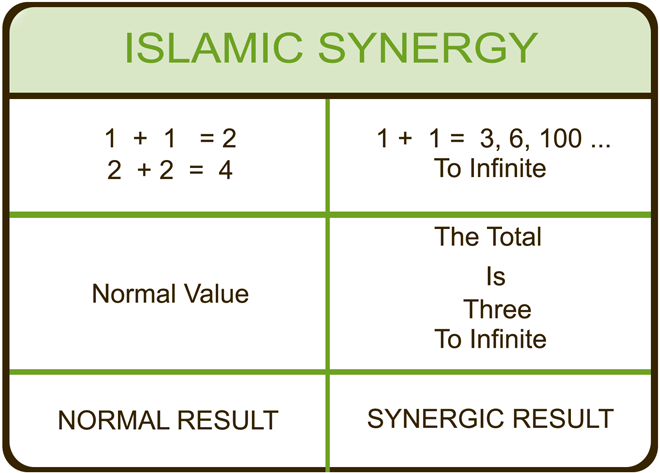 Principle Ten is the Islamic Synergy.